Fall is by far my favorite season. And my home & clothes tend to reflect that: lots of cozy textures, warm neutrals, & subdued prints with hits of color here & there. I always prefer my fall wardrobe over any other time of the year. I tend to think that while we can appreciate the colors, textures, scents, & sounds of multiple seasons, we all probably have one season that we favor over all the rest. Knowing this can help you in dressing both your home & yourself. The "winter" room is full of soft, muted colors with just a hint of shine. Think snow & icicles on bare tree branches, or the glint of champagne in a crystal glass on New Year's Day. If you prefer winter, your wardrobe (or home) might include creamy whites, golds, tans, greige, & lots of texture (cable knits, faux fur, etc.). The "spring" & "summer" rooms are similar, but there are differences. 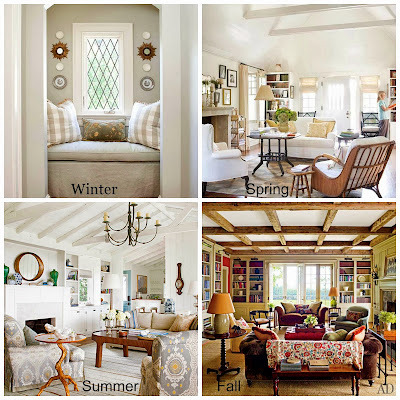 The spring room's warmer tones & drapery show the transition from cold winters to hot summers. The colors are still a little muted, like spring buds that are emerging but haven't quite blossomed into bright colors. Spring wardrobes may include both whites & off-whites, lighter hues of color (lavender, spring green, robin's egg blue), & softer textures (like thin cotton sweaters). You can see the difference in the "summer" room immediately. The whites are pure, the color in the room is both brighter & cooler in hue, & the textures are smooth & slick (the chairs) or rough like the outdoors (the wood table reminiscent of driftwood). This feels like a room that would provide cool relief from the hot summer sun. There are no drapes, & only one of the windows shown has any type of coverage at all. Summer wardrobes hope to counteract the heat of summer: gauzy linens, lots of white, bright colors (inspired by the ocean, sky, 4th of July, etc. ), & favor any texture that feels cool to the touch. Finally, the "fall" room is full of the colors of harvest time. 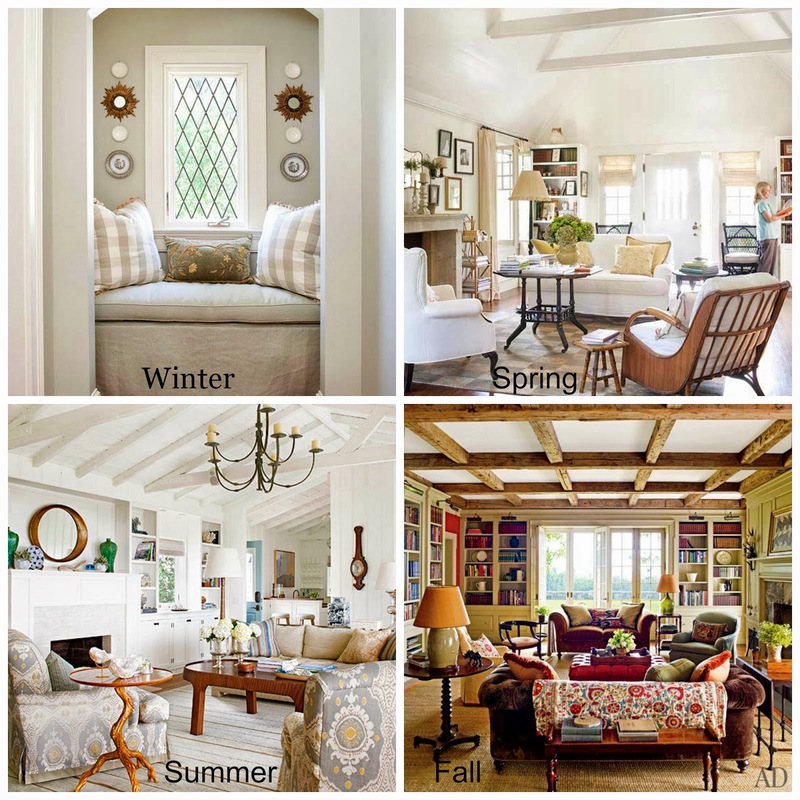 Books & throws, cozy fabrics like the velvet on the sofa, creamy paneling, & darker toned woods invite you to snuggle in & prepare for longer days & cooler temps. But, it's not a dark room - the overall color (on the paneling, built-ins, & rug) is still a light neutral, the paint just barely darker than off-white. It is the accents in the room that provide a cozier feeling. Fall wardrobes might consist of jewel tones, darker neutrals, leopard prints, leather, etc. As I mentioned above, the favorite items in my home & wardrobe are "fallish" in feel & color. To give you an example of how wardrobe can influence home decor & vice-versa, I created an outfit based on the fall room above (designed by the talented Gil Schafer). The outfit was inspired by the room's feel, but is not an exact copy - the colors refer to each other but aren't matching. What's your favorite season? Is it reflected in your home & closet?